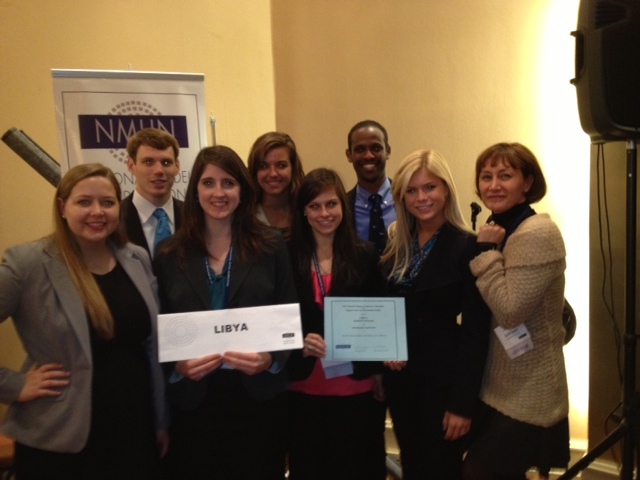 The inclement weather from Hurricane Sandy did not deter Samford University's Model United Nations team from celebrating success at the 2012 national competition Oct. 26-28 in Washington, D.C. The team received the honorable delegation award for their performance in representing the Republic of Libya, which faculty advisor Serena Simoni called "a very difficult task, given its major political transitional phase." The team competed against 70 other universities from around the world. NMUN volunteer staff members recommend 10 percent of the delegations in their respective committees for awards, based on performance. "Although five of the seven team members were new, they were impressive and their seriousness and competence were evident to all the participants and organizers," Simoni said. Team members are Devon Arnold, a senior international relations major from Dallas, Texas; Gina Harwell, a senior international relations major from Pulaski, Tenn.; Lauren Hunt, a sophomore public administration major from Dothan, Ala.; Surf Kirubel, a senior sports management from Acworth, Ga.; Mary Moody, a senior international relations major from Silsbee, Texas; Katie Peake, a sophomore international relations major from Huntsville, Ala.; and John Yarbrough, a sophomore pre-business major from Brentwood, Tenn. The team's return to Birmingham is delayed because of the weather, but Simoni said in an email to the campus that she anticipated a Nov. 1 return.